The delegation of policy-competencies to the European Union has changed the context in which national actors form their interests and represent them. Shaping European markets and societies, EU regulation has important effects in the member states. 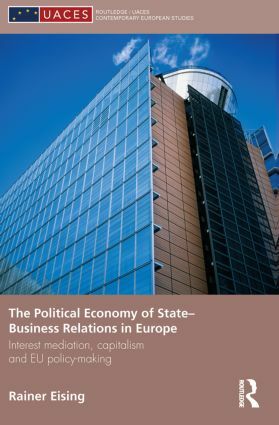 This book analyses how business interest organizations respond to this challenge and what strategies they develop to cope with European integration. Starting from the idea that institutional contexts, resource dependencies, and organizational characteristics explain, to a considerable degree, how interest groups adapt to EU policy-making, this study delivers important insights into EU governance. The empirical analysis draws on a comprehensive data set of German, British, French, and EU business associations and large firms. Divided into three parts, it moves from the study of domestic contexts to the analysis of multilevel-governance in the EU before finally scrutinizing in greater detail the factors that shape the access of interest groups to the EU institutions. Making an important contribution to the development of institutional and organizational accounts of interest groups in the EU, this book will be of interest to political scientists, economists, and sociologists working in the areas of European integration, comparative European politics, political economy, interest groups and civil society. The evolution of the EU interest group system: To join or not to join? The politics of access in the European Union I: Towards elite pluralism?